The Islamic State's most recent threat: Egyptian Christians are "our favorite prey". On February 20, 2017, ISIS released a new video urging their followers to terrorize and slaughter Christians in Egypt. The 20-minute video was titled "Kill all the Kuffar" (kuffar means infidel, or non-Muslim). 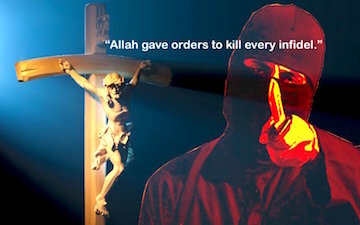 Also in the video, one of the jihadists says: "Allah gave orders to kill every infidel". ISIS described Egyptian Christians as their "favorite prey." There were also photos of the suicide bomber who conducted the church attack in Cairo on December 11, 2016. The ISIS video also included clips of the Egyptian Christian pope and other prominent Christian leaders and businessmen who have been outspoken about protecting the Christians in Egypt. But according to the narrator of the ISIS video, "Christians are not deserving of protection because they are infidels". The narrator in the ISIS video says the Cairo church attack in December was "just the beginning". ISIS accused Egyptian Christians of insulting Islam, and said ISIS will be carrying out more attacks against them. Two days after this video was aired on social media, ISIS killed two Christians in al-Arish. Authorities in Egypt examined the video carefully and concluded that: “The most prominent observation in the ISIS video is the absence of the name Islamic State in "Sinai Province" and that it instead used "Islamic State in Egypt". This gives the impression that the Islamic State's "Sinai Province" operations now exceed the Sinai and have reached Cairo, especially following the Cairo Church attack." One jihadist in the ISIS video, who calls himself Abdullah al-Masri (Abdullah the Egyptian) says: "Oh worshipers of the cross (Christians) the soldiers of the Islamic State are watching you." In December of 2015, Egyptian president Abdel al-Fattah al-Sisi went to al-Azhar University and asked its top instructors to reform their teachings. But al-Azhar dismissed Sisi's plea. Sheik Ahmed al-Tayeeb, Egypt's highest Muslim authority and Grand Mufti of al-Azhar University, the Muslim world’s most prestigious Islamic University in Sunni Islam, was recently interviewed on Egyptians TV. Tayeeb said: “Al-Azhar doesn’t change religious discourse — al-Azhar proclaims the true religious discourse, which we learned from our elders”. By "elders", Tayeeb is referring to Islamic literature written during the Medieval era. Last month, on January 3, 2017, a Muslim man snuck up behind a Christian shopkeeper and slit his throat. The Christian made it into his shop where he collapsed and bled to death. A surveillance video captured the moment of the attack (video below). Lamei’s son, Tony, was inside the shop when his father was killed: “He was slain in front of my sight. I’m sad that we live in a country that doesn’t have security and safety. He was my father, friend, everything sweet in my life." Top video: The moment when Lamei's throat was slit in front of his shop. Middle video: Church attack that took place December 11, 2016, just moments after the bomb went off. Warning: Graphic.